Situated just 50 metres from Pefkos main beach, the Matina Pefkos Aparthotel is the perfect setting for a relaxing yet unforgettable holiday. The peaceful location and the friendly, fun atmosphere appeal to all types of guests, from families to couples and everything in between. With 2 swimming pools and 2 children's pools, 2 snack bars opening well into the evenings, a delicious onsite restaurant Meltemi and a sports court, you will never be bored at Matina Pefkos Aparthotel. You will find an onsite supermarket open daily with everything you could need for your stay. 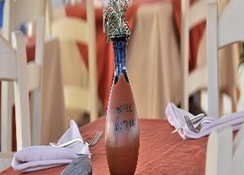 Matina Pefkos Aparthotel offers complimentary wi-fi in public areas. The complex has 143 rooms including Studios (for 3), 1-Bedroom Apartments (for 4), Superior 1-Bedroom Apartments (for 5) and 2-Bedroom Apartments. Free wireless internet connection is avaulable in public areas. Pefkos beach is sandy, sheltered and has sun beds, umbrellas and boasts great sunset views. Plenty smaller beaches and rocky inlets to discover along the coastline. Key words here are nature, laid back and uncrowded – perfect choice for a simple beach holiday. 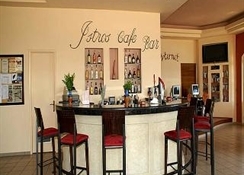 Some great restaurants, cafes and bars around to. 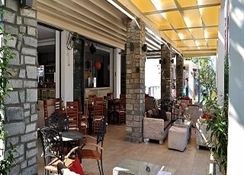 The hotel has a nice a la carte restaurant; Meltemi, 2 snack bars – one for each pool, the People's bar and Matina's snack bar which is also rocks on BBQ night, Greek night, and the karaoke. 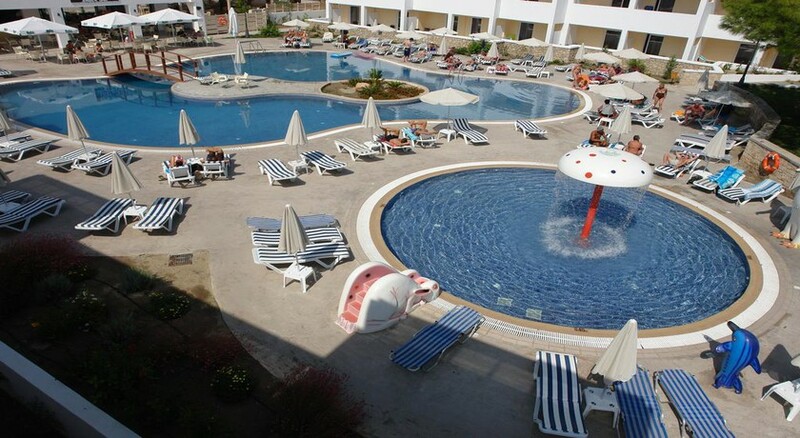 Family swimming pool, a children's pool, 2 separate game zones at Matina snack bar including sports court. And the beach is on the doorstep. 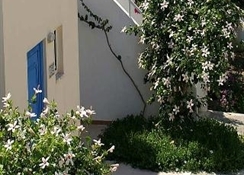 The studios and apartments (1 – 2 bedrooms) at Matina can easily sleep from 3 to 5 adults. We find a fully equipped kitchen with mod cons including a toaster and a microwave. 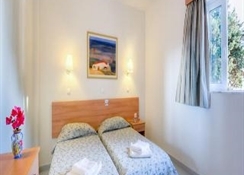 All the rooms have the option to include air-con (payable locally). The bathrooms have a bath and a shower, and there is a hair dryer. Each studio and apartment has its own private balcony or terrace with table and chairs for a bit of al fresco. 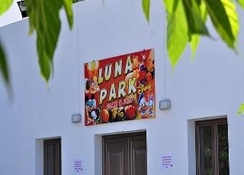 The hotel is booked as half board and there’s also a great on-site supermarket selling everything from fresh fruit and bread, to lilo's, beach towels and more. Transfer from Rhodes Airport to Pefkos is approximately an hour; lots of transfer bus companies operating.